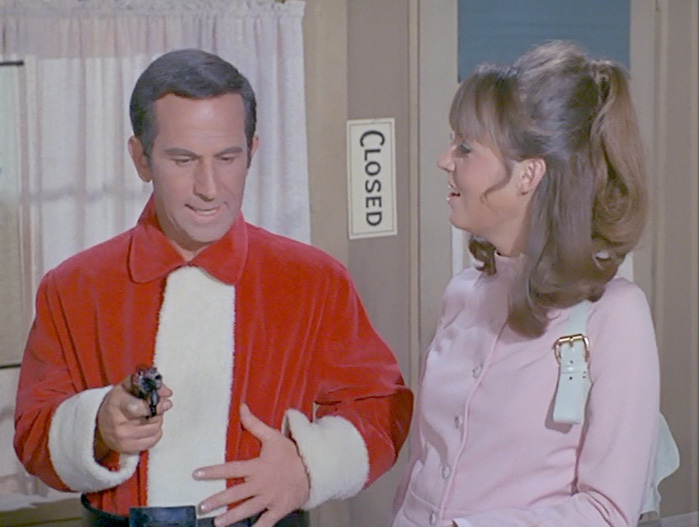 The Old Spy in the Santa Suit Trick. Yes, that's Maxwell Smart hiding behind the beard. Christmas is here – which is why this blog has found itself in a lull. 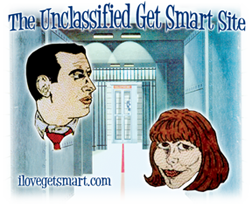 The topic of Christmas naturally takes me to Get Smart. No, really, this is legit considering that, back in the early days of ilovegetsmart.com, I used to get all kinds of emails from people seeking shoephones for Christmas gifts. 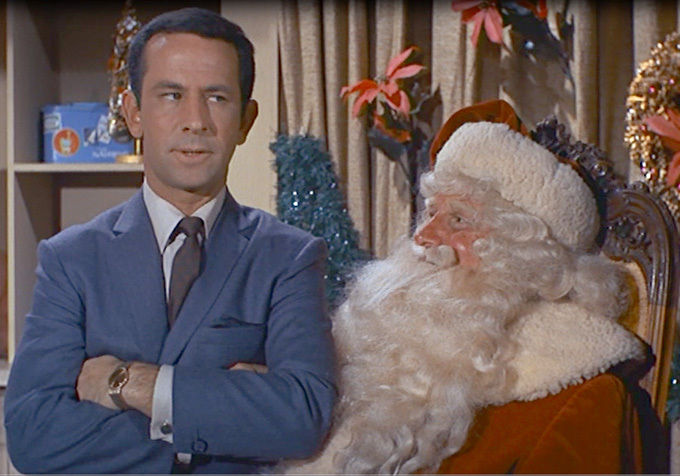 Santa actually made a couple appearances in Get Smart. Agent 86 collects intelligence from Agent 12. 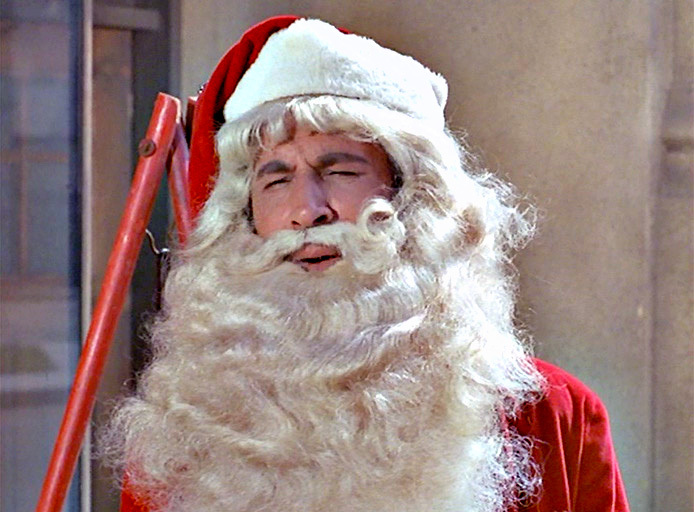 St. Nick’s initial cameo was in the first season episode, Our Man in Toyland. Santa in this case is Agent 12, one of the agents Control has stationed in Bowers Department Store, which is a Kaos front. Max has a few moments seated on Agent 12’s lap, discussing enemy courier Leopold. They keep the exchange brief, so they don’t look suspicious. Uh huh. Before Max leaves, Agent 12 offers him a lolly. Max tries to explain his choice of disguises. 99 tries not to laugh. The next Santa appearance is in the fourth season episode, a Tale of Two Tales. When Max learns that 99 is on a mission – and could be in danger – The Chief allows him to tail her. Despite it being August, Max disguises himself as a Santa posted by a donation kettle. 99 initially mistakes him for a Kaos agent -until he tries to rescue her from an actual Kaos agent. Max later explains, since it was the night of the Control costume party, all the good costumes were taken. At least he wasn’t stuck with a chicken suit. 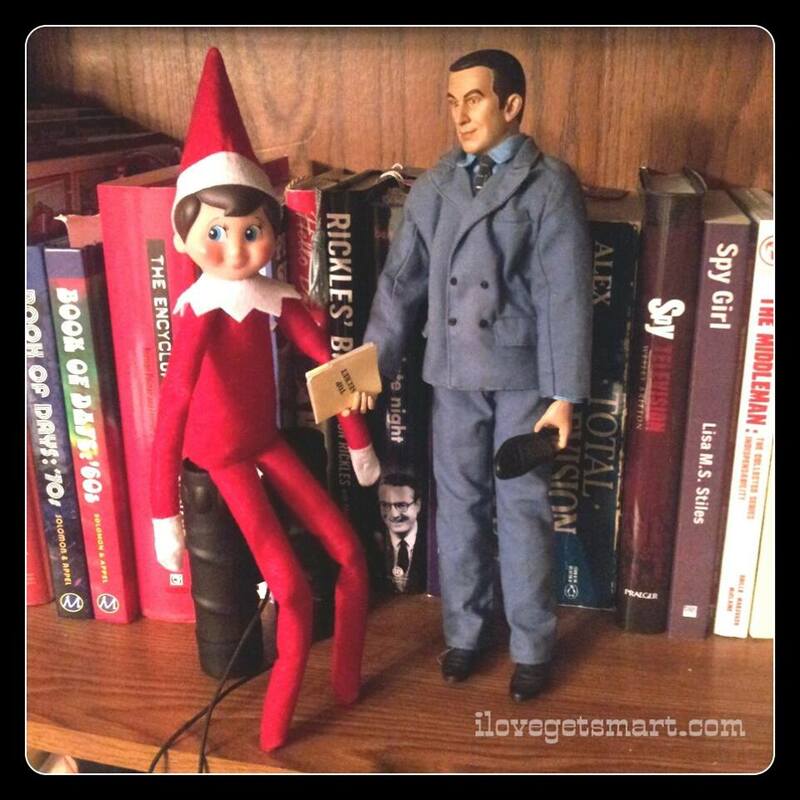 The topic of Get Smart Santa cameos naturally brings us to Elf on the Shelf. Max and Red the Elf exchange some top secret Christmas information. Sure it does. Just work with me. 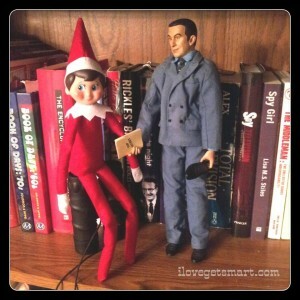 If you have a child in your life, you probably know all about Elf on the Shelf. You may think the concept is cute. You may find it annoying because you forget to hide the darn thing. Or, you see it as an opportunity to resurrect your own toys and collectibles. We’ve had an elf named Red for the past two Christmases. If I remember to hide him, he ends up in the typical spots: The tree, on a shelf or the mantel. I do take one day for bit of fun where he meets up with Maxwell Smart. Last year we saw Max and Red have a secret bookshelf meeting to exchange clandestine information. In the process, they positioned themselves in front of all the espionage related literature they could find. This year they gathered around a small Christmas tree decorated with even smaller GS-themed ornaments. Said tree went to work with me and found a home on my desk. Everyone else in the newsroom either scratched their heads or considered the source. As for next year’s Elf/GS adventure? Right now I’m just trying to remember where I last hid the little guy. 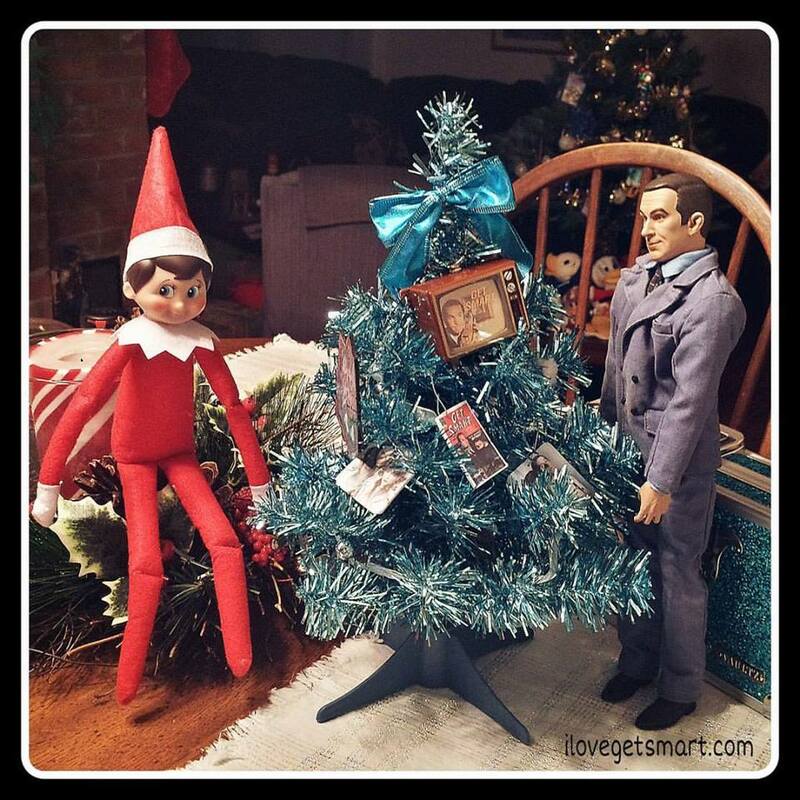 Red the Elf offers Maxwell Smart some tree decorating advice.